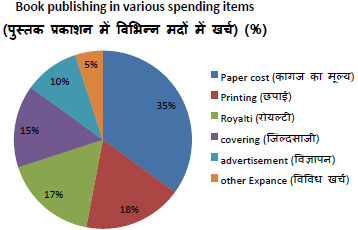 A book published by a publisher on the various items of expenditure has been below the pie-chart. Its well-studied and answer the questions below. The value is the percentage of the cost of binding the paper? Royalty relevant central angle, how much advertising is consistent with the central angle? The printing cost is Rs 30600 has the royalty? How relevant is the central angle of binding? If miscellaneous expenses are Rs 6,000, how much is spent on the royalties? 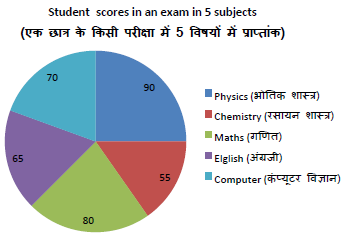 The following pie-chart by a student in an exam scores are five subjects. 450 is the sum of the scores. Pie charts Please answer the questions below by studying well. What percentage of marks obtained by students in physics of total marks ? Which of the following subject student score 100 marks ? The difference of scores in mathematics and computer science and the two subjects are equal marks the difference? The sum of the scores of students in computer science and physics, The chemistry and English much more than the sum of the scores? what is the average scores of the five subjects? In which subject student obtained 22.2% marks? what is the percentage of total score to the score obtained in three subjects ? Below are two pie charts. In a pie chart, the percentage of college students studying in different faculties, while other pie-chart is the percentage of girls in different faculties. Please answer the questions below to read them carefully. How many girls are in College art department? In which subject number of boys is minimum? What is the ratio of boys and girls in Political Science? How much higher percentage of girls than the percntage of boys in the arts ? Which of the following two subjects have the same number of boys? The country has a population of 26.25 Crore. Various age groups is shown in the pie chart below. Careful study of the pie chart to answer the questions below. What is the central angle for teenagers? Which group is the minimum population and the population of this age group is how much? What is the central angle of the age group, which is quadruple the population of any other age group?